Dry, moderate, or wet. 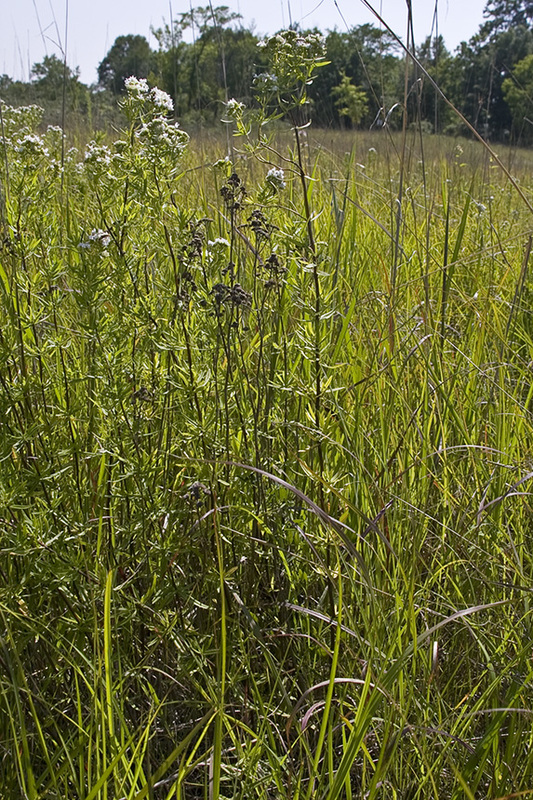 Prairies, upland woods, meadows, roadsides. This is a 12″ to 36″ tall, erect, perennial forb that rises from spreading rhizomes. It often forms colonies. 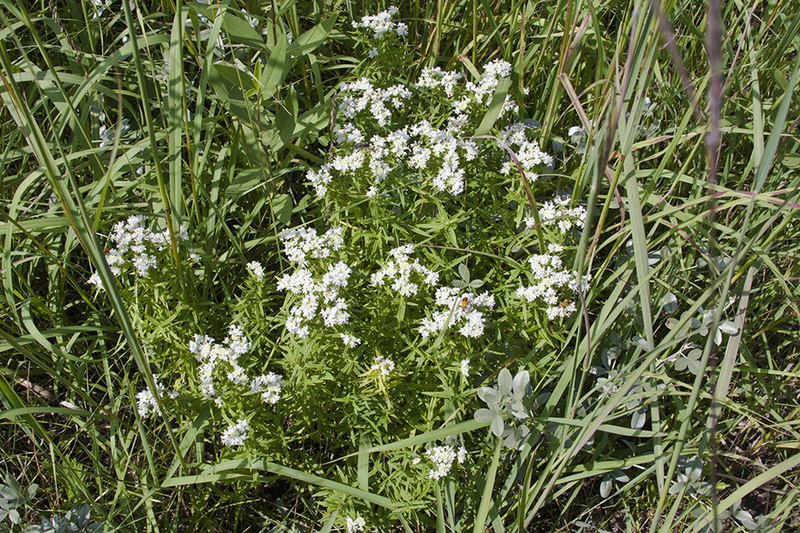 The stems are erect, square, green or reddish, and frequently branched above the middle. There are short, white hairs mainly along the ridges. 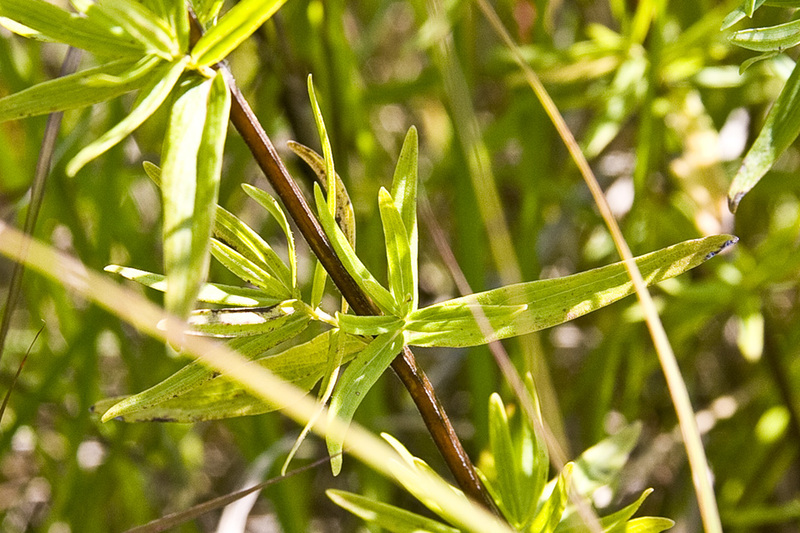 The leaves are numerous, opposite, stalkless, and narrowly lance-shaped or lance linear. 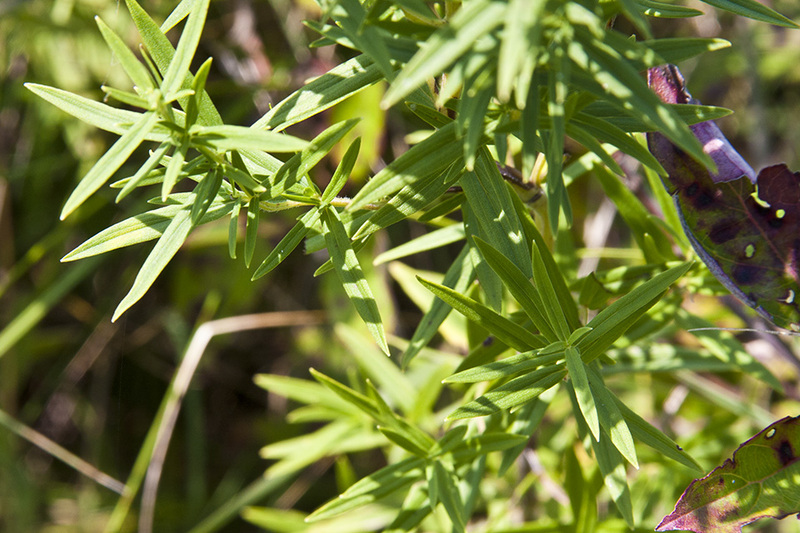 The main leaves are 13 ⁄16″ to 2⅜″ long, and ⅛″ to ⅜″ wide, the upper leaves much smaller. The upper surface is hairless. The lower surface often has short, soft hairs along the midvein. The margins are untoothed and rough to the touch. There is a prominent midvein and 3 or 4 pairs of lateral veins. The uppermost lateral veins arise near the middle of the leaf. Crushed leaves have a strong mint scent. The inflorescence is a branched arrangement of multiple compact, flat-topped, head-like clusters at the end of the stem and branches. 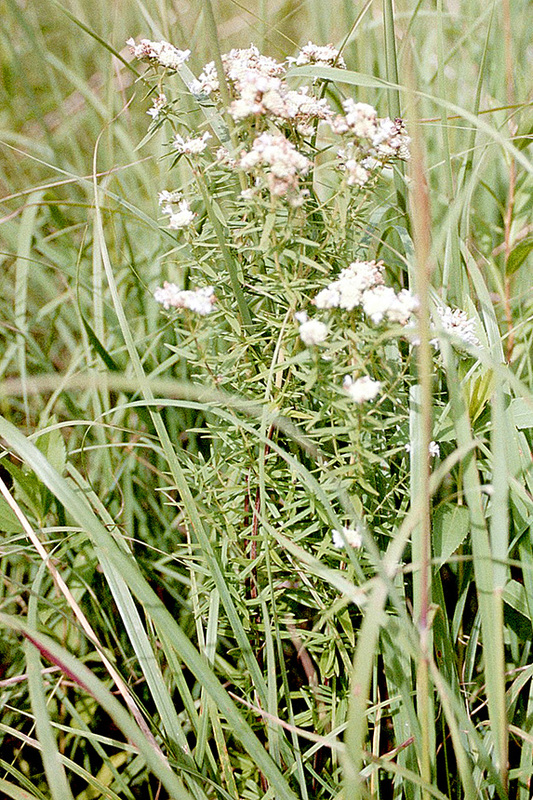 The inflorescence is about 3″ wide. 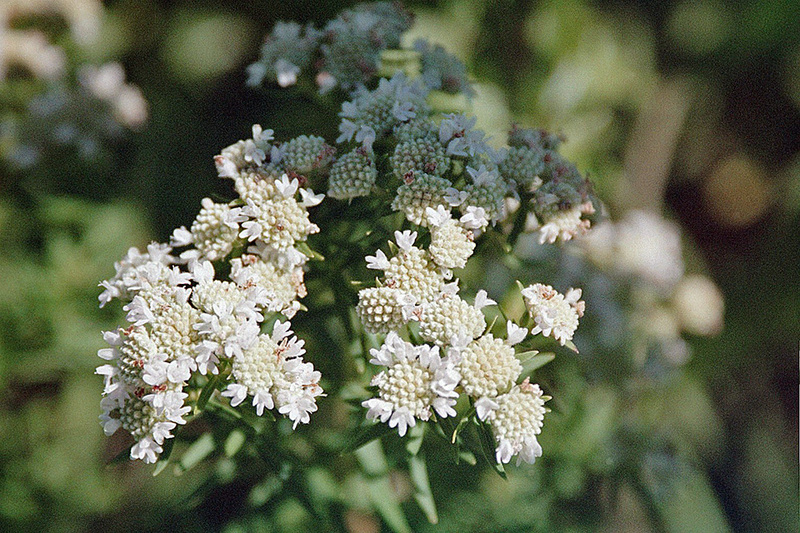 Each cluster is about ¾″ wide and is composed of up to 50 flowers. Only a few flowers in each head are open at the same time. 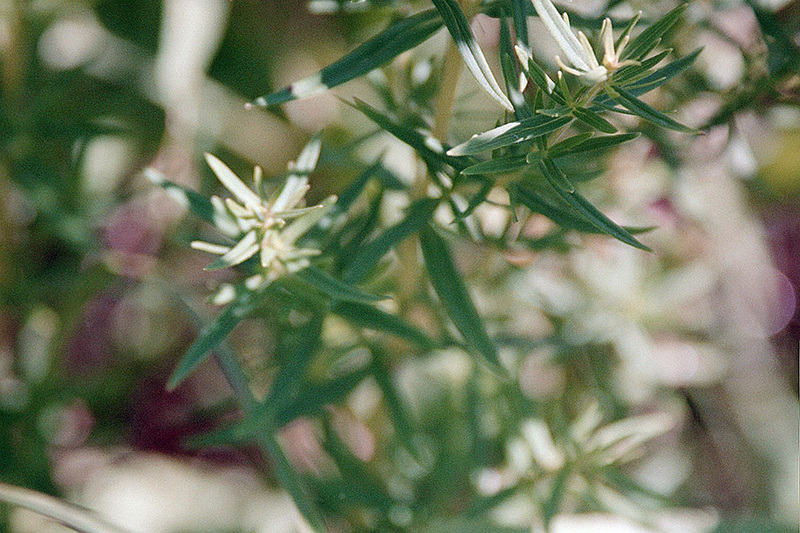 The flowers are about ¼″ long and usually white, occasionally pinkish or pale lavender. There are 5 petals fused at the base into a corolla tube then separated into an upper and lower lip. The upper lip is erect and unlobed, and may be notched. The lower lip is bent backward, divided into a central lobe and 2 shorter lateral lobes, and sometimes spotted with pink or violet. There are 4 stamens protruding sligjtly from the corolla tube. Each stamen has an anther that is yellow to pink when fresh, soon turning brownish-red when dry. There is a style with 2 stigmas protruding well beyond the corolla tube. The fruit is a dark brown, egg-shaped or oval nutlet about 1 ⁄32″ long. 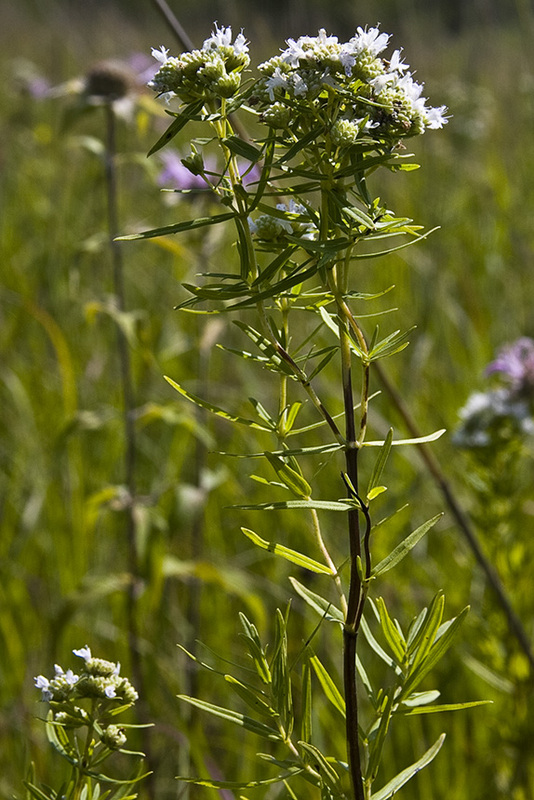 Narrow-leaved mountain mint (Pycnanthemum tenuifolium) stems are hairless. The leaves are linear, narrower, mostly 1 ⁄16″ to ⅛″ wide. The largest leaves are never more than ¼″ wide. There are only 1 or 2, sometimes 3, pairs of lateral veins. All lateral vein arises in the lower quarter of the leaf. Crushed leaves have almost no scent. 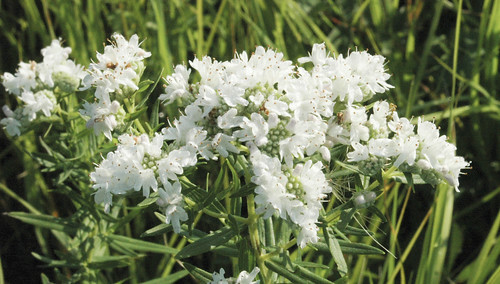 The Virginia Mountain Mint (Pycnanthemum Virginianum) is a great accent of white color for your native planting! This plant attracts lots of insects and butterflies. Plumes moths (Order Lepdoptera, Family Pterophoridae) are small airplane-shaped flower visitors. 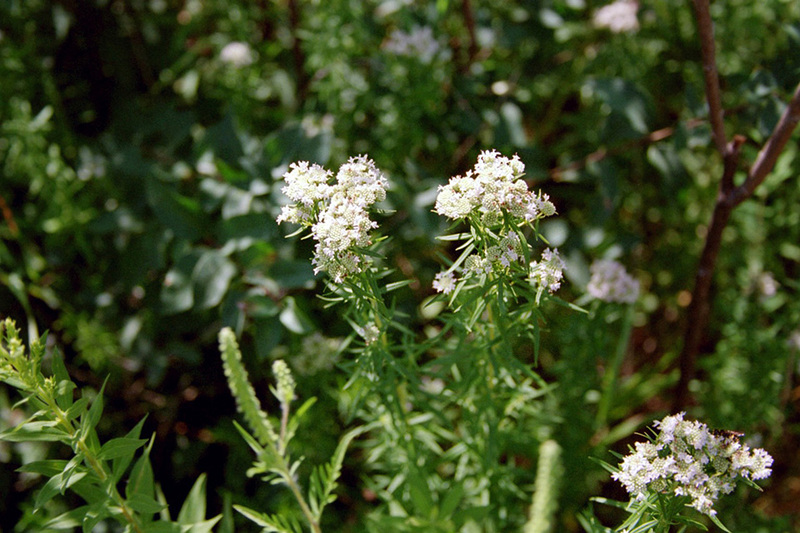 Virginia mountain-mint is a prairie plant that is shown here cultivated in an urban backyard in Columbus Ohio, USA on August 3, 2014. 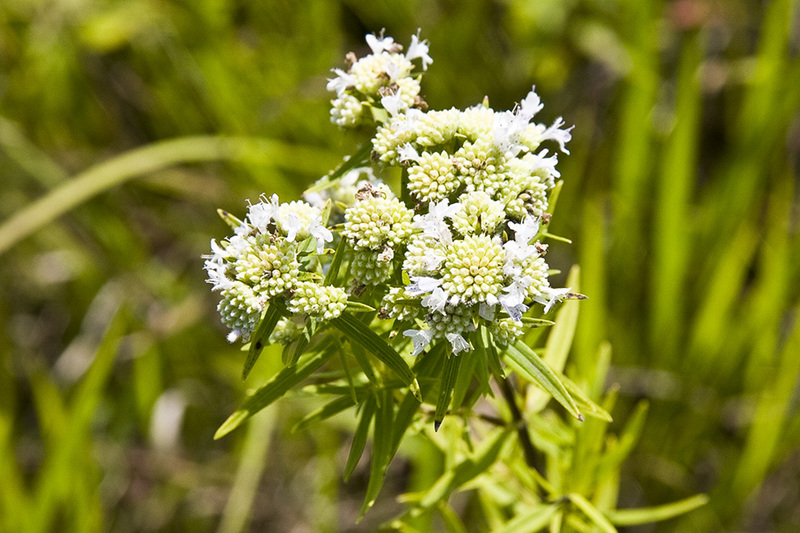 Mountain mint (Pycnanthemum virginianum) is a prairie perennial wildflower that is attractive to bees.